Thank you for your interest in this project, here are further details of the retreat. We have tried to keep it as brief as possible, and such things as how to get to the retreat will be sent to you after registration. The registration form is at the end of this page, if you wish to participate please complete it. What's going to happen on the retreat? The work retreat will be preceded by a silent meditation retreat. We find both parts support the experience of the retreat as a whole. The silent retreat helps us to slow down and connect before engaging with the work. While the work retreat can be a wonderful way of expressing our compassion and wisdom. If you would like to do only one of the two parts of the retreat; just the silent retreat or just the work retreat, please choose the appropriate option on the registration form. The daily schedule begins at around 6 am and ends at around 9 pm. This will include sitting and walking meditations, teachings, time for yoga, chi gong or other exercise, and the opportunity for both group and one-to-one meetings with a facilitator. Three vegetarian meals a day will be served, and accommodation is in shared rooms. This part of the retreat will combine social engagement and meditation through compassionate action. We will work about 5 hours a day with the people of Anandwan. The work is an integral and important part of the retreat, allowing us to meet the community through shared activities. We can also explore our relationship to roles and where our sense of self arises. There will be time for meditation together 3 times a day, and group sharings and dharma discussions several times a week. The work retreat is an opportunity to practice generosity and service with like minded people. The support of others in the group assists us to deepen and meet the challenges that may come up. One day a week will be a full silent day for meditation, and one day a week will be unscheduled with no work or group events. Hospital & Home for the Elderly: Dressing wounds, personal care, or massage with the patients and the elderly. Farming: Working in the fields or in the plant and tree nurseries. Workshops: Card making, printing, mechanics, electrics, sewing, leather work, woodwork. Schools: Offering activities in the schools for hearing and visually impaired children, including arts, crafts, music, and games, as well as extra-curricular activities. Kitchens: Chopping vegetables and making chapatis. There can be other possibilities depending on people's skills and interests. Bringing work and meditation together in Anandwan creates an opportunity to explore our relationship to being and doing, and to investigate what really helps. 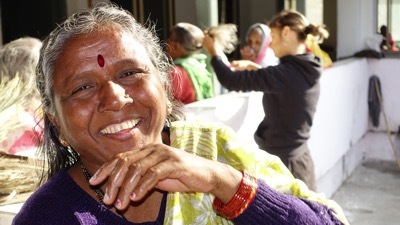 Anandwan is a living communal expression of compassion. As such it can be a place of incredible suffering and also of incredible love and joy. Sometimes these two poles of a spectrum seem so closely entwined they share the same breath. When we are here we may touch the tenderness of life that includes pain, illness and even death. We hope this retreat will be a positive life transforming time of trust and healing. Anandwan was founded in 1951 by the Amte family as a home for the leprosy afflicted. The emphasis of the project is not only on treating the physical disease, but on allowing every individual to live a full and productive life. They say "Give them a Chance not Charity", as a result Anandwan and its satellite projects quickly became self sufficient in food and services. 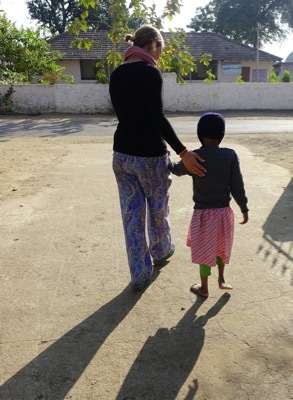 Over time Anandwan opened its gates to many people, and today it is home to 5000 residents. 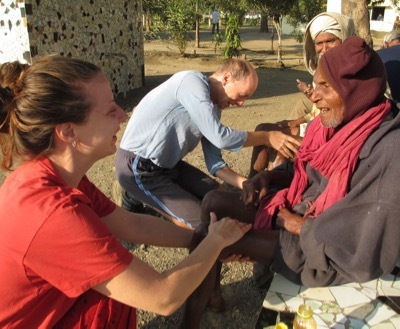 These include leprosy patients and their families, visually and hearing impaired children who receive an education there, the physically and mentally disabled, as well as volunteers who have dedicated their life to this community. Although leprosy is a curable disease, and these days it can be easily diagnosed and efficiently treated, there is still a lot of prejudice and fear towards the disease. Most people in the community have been ostracised and outcast from society, our coming there is an act of solidarity and friendship and is truly valued. On many retreats the words teacher or leader is used to denote the role which we call facilitator. We have chosen facilitator - those who make it easier - over teacher or leader as we feel it is both more accurate of the role, and hopefully, more empowering to the participants. The facilitators will be offering teachings and practices based on the spiritual traditions of Buddhism. In addition to the silent meditations, the facilitators will offer a mediation with suggestions of techniques to explore, and a daily talk on a theme for contemplation. They will also be available for group and personal interviews to support you to explore your practice. The facilitators will be the contact between the participants and the Anandwan administration, and have more responsibility as far as holding the structure. The facilitation of this retreat provides a safe environment to allow each of us to freely offer our wisdom and support to each other. We envision this retreat as an experiment of living and working together, with each of us participating and contributing to the fullness of the retreat. The facilitators offer their time and energy freely and do not receive any payment for what they do. You are welcome to offer them a donation at the end of each retreat. See below for more information about supporting the facilitators. Three vegetarian meals a day are provided, but you should bear in mind that it is traditional Indian fare. We will additionally have 2 pieces of fruit per day, salad once a day, and we will be growing sprouts. Sorry, there is no possibility of catering for special diets. We have water filters for the use of the group, in our experience they are safe and efficient. Anandwan has a policy of reducing plastic so please bring empty bottles that you can fill up. If you feel this system is inadequate, please bring your own means of filtering/purifying water. 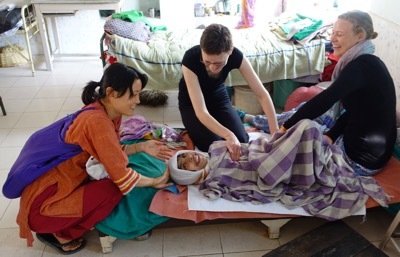 Anandwan is a low-risk area for malaria, and we will not be there in the malarial season. But there is still the possibility to contract malaria so the doctors there recommend taking preventative medicine. During the retreat we provide a homeopathic preventative medicine against malaria. We ask that you bring your own mosquito repellant. The Silent Meditation Retreat in Somnath will cost 10,500 Indian rupees. The Work retreat in Anandwan will cost 24,500. Doing both the Somnath silent retreat and the Anandwan Work Retreat (including the 2 day between retreats) will cost 37,000 Indian rupees. Keep in mind that this is a great place to buy gifts for friends and family. People have typically spent an extra 8,000 - 11,000 Indian rupees during the weeks in Anandwan. To register your place for this retreat we require a non-refundable deposit of approximately 40% of the total cost. Details about this will be sent via email. The cost of this retreat does not include a fee for the facilitators. The facilitators are offering their time and teaching as part of an ancient system of ‘Dana’- an old word from the time of the Buddha meaning ’generosity’. This is a gift economy in which teachings are offered freely, and those who come to hear them are invited to offer donations to support the teachers to continue offering more in the future. We will explain more about this in our booking materials and in the week. If you would like to join the retreat but require financial assistance, please do contact us. If you are touched by this project but cannot join us, you could also help by sponsoring someone else to go, please contact us for further information on how to do this. Fill out the registration form and you will receive an email with more information; such as how to get there, and how to pay the deposit. If you do not hear from us within a week, please check your spam / junk mail and if our message is not there please contact us again.